Ant-Man and the Wasp, 2018. 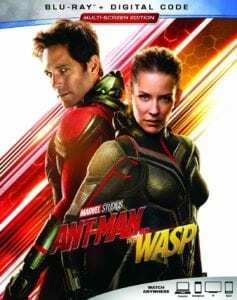 Starring: Paul Rudd, Evangeline Lilly, Michael Pena, Walton Goggins, Bobby Cannavale, Judy Greer, Tip “T.I.” Harris, David Dastmalchian, Hannah John-Kamen, Abby Ryder Fortson, Randall Park, Michelle Pfeiffer, Laurence Fishburne, and Michael Douglas. 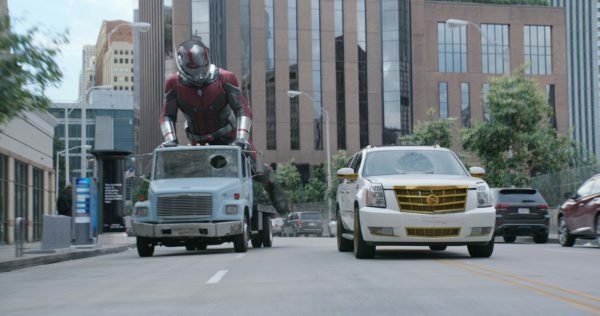 The Marvel Cinematic Universe keeps chugging along with the Blu-ray release of Ant-Man and the Wasp, a movie with the theme of family at its core. Okay, that’s not the most original blueprint for a movie, but this one is still a fun ride, although the Blu-ray is a bit skimpy when it comes to bonus features. If you’re not sure what theme to hang your hat on when writing a screenplay, you can’t go wrong with the importance of family. And, really, what more do you need from a movie like Ant-Man and Wasp? 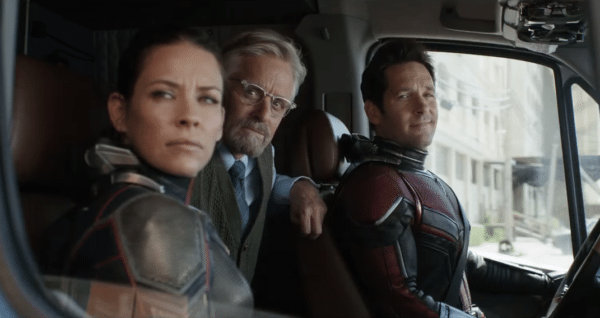 You already have Paul Rudd’s goofy “Aw, shucks” turn as Scott Lang/Ant-Man, along with the gravitas of Michael Douglas as Hank Pym and the menace of Laurence Fishburne as Pym’s estranged business partner, Bill Foster. All you need to do is whip up a back story about Pym’s wife Janet being lost in the quantum realm in 1987 and Lang having a quantum entanglement with her due to his own trip to that sub-microscopic world. I’m sure scientists who have devoted their lives to quantum physics could find many things wrong with that part of the story, but who cares? 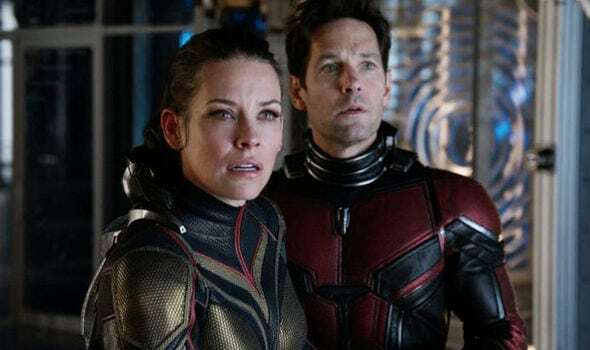 It’s a convenient excuse to have Pym and his daughter Hope van Dyne bust Lang out of house arrest, much to the chagrin of the FBI agent who’s sure he’s being made a fool of. It’s also an excuse to kick the plot into motion as the three try to acquire the parts they need to create a tunnel so they can rescue Janet. They turn to a black market dealer who double-crosses them, leading to Hope becoming Wasp alongside Lang’s Ant-Man. And thus a new superhero duo is born in the Marvel Cinematic Universe. The best part of the film lies in enjoying the various ways the writing crew (there are five credited writers, which means there were probably even more) plays with Pym’s enlargement and shrinking technology, such as a chase scene where a Hello Kitty Pez dispenser suddenly becomes enormous. There aren’t as many laughs in this one as in a Guardians of the Galaxy movie, since Lang is the only trickster of the group, but Ant-Man and the Wasp is still lightweight fun that can be appreciated without needing to be fully steeped in MCU lore. The bonus features aren’t as robust as on other MCU home video releases, but given this film’s lesser importance in the overall canon, that’s not surprising. Director Peyton Reed supplies a commentary that discusses the nuts and bolts of making the movie, and he also delivers a one-minute introduction to the film in which he talks about his main objective behind it. There’s also a group of four making-of featurettes that run about 22 minutes total. They focus on Ant-Man, the Wasp, and Hank and Janet Pym, as well as the visual effects and production design. There’s also a gag reel and some outtakes, along with about four minutes of deleted scenes with optional commentary by Reed. The main bonus feature in the digital realm is the nine-minute 10 Years of Marvel Studios: The Art of the Marvel Cinematic Universe, which talks about the in-house art team that was set up a decade ago to deliver concept art for all of the movies since then. There’s also a silly commercial for Online Close-Up Magic University.